I have no idea what Collateral Beauty is meant to be. Is it a supposedly-endearing tale of overcoming grief, or a masterclass in displaying the most insane and ill-conceived ideals on-screen with some of Hollywood’s best actors completely embarrassing themselves on-screen? 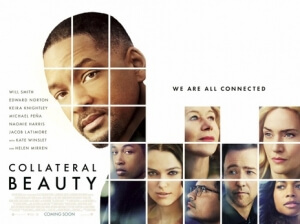 Whatever it is, I think we can all agree that Collateral Beauty is a complete and utter failure of a film, one that should honestly be studied in film classes about how NOT to write a film, or even MAKE a film with such awful undertones. From the trailer, you may have gotten the basic gist of the plot; an advertising executive (Will Smith) is deteriorating after a personal tragedy, which his work friends (Edward Norton, Kate Winslet, and Michael Peña) can only helplessly watch from the sides. In his spare time, he seems to write letters to abstract personas like Death, Love and Time, only to then – lo and behold – actually be visited by those three concepts in person, with Helen Mirren as Death, Keira Knightley as Love, and Jacob Latimore as Time. So, it’s basically a modernised version of It’s a Wonderful Life, right? Oh, how wrong you are. What the trailer DOESN’T show you is that not only are the three “concepts” actually actors hired by Norton, Winslet and Peña, but they are instructed to confront Smith’s character several times in the streets of New York with a private detective (Ann Dowd) following them and filming everything. Why? Because Smith’s so-called “friends” plan to digitally remove the actors from the footage, and make it look like Smith is crazy which would force him to resign and hand over his responsibilities to them, so that they can sell the company and thus save their jobs. Aside from the fact that this may be one of the dumbest plots of the entire year, and keep in mind this was a year that also had Kevin Spacey turn into a cat, I have never seen a script that has been so ill-conceived, with this many logical traps within its own body, and with this many talented actors actually agreeing to say these words in front of a camera. The movie never even addresses the fact that what these horrible people are doing to their good friend is asinine and tasteless, and instead replaces reason with scenes where all these actors are sobbing endlessly into the camera about dead children or their own apparently terrible lives (note: many of these people actually live comfortable existences in cushy apartments in one of the most expensive cities in the world). To say that this movie is just emotionally manipulative is about as underselling as the trailers for this damn movie; this is an infuriating, forceful attempt to mine tears out of its audience, all to cover up the fact that this script has far too many fatal flaws that make the ones in Passengers look respectable by comparison. The worst part about it all, is that it works; the packed screening I was at had more sniffling noses than a flu remedy convention, which meant that either every single person in that audience had a cold or was being suckered by the many instances where actors stop right in their tracks to have tearful monologues about dead children, because as we all know dead children equals fountains of tears. But not me; I was strong enough to see this movie for what it truly is, a soulless and frankly disturbing sob story that had a truly terrible plot and script which was made worse by bad direction, career-low performances by most of the cast (bar Will Smith and Helen Mirren, who to their credit seem like they’re actually trying despite the dreadful material), and the most nauseating of emotionally manipulative scenes that fail to cover up what a horrific story it actually is. The majority of the characters in this are so despicable and unsympathetic that the several sub-plots give us even less reason to care about them. Norton’s character has a sub-plot where he’s trying to reconnect with his young daughter who hates him because he cheated on his wife, but any emotional investment goes out the window when you see what Norton’s main role in the film actually is, not to mention that the daughter comes across as a spoiled little brat who really needs a good smack across the face (now I don’t endorse child abuse in any way shape or form, but when it’s towards entitled little shits like this then I say go all for it). Winslet supposedly wants kids via a genetics company, which sounds like something only a hack writer would come up with as a main character sub-plot involving a woman, while Michael Peña is dying from coughing up blood into a handkerchief; all things that are uncomfortably shoved down our throats to get a tear to run down our face, but it completely fails because it’s so bloody tedious and enraging. It just represents the very worst depths that Hollywood can go to just to get an emotional reaction out of its audience, topped off with a sickening misunderstanding of how normal people function and how grief actually works. If you want my advice, just skip this giant dog turd of a movie, a truly awful weepie that fails at everything it sets out to achieve. Collateral Beauty has one of the most ill-conceived concepts of any major Hollywood film in years, but even more offensive is its relentless attempts to emotionally manipulate the audience with several tear-jerking scenes to cover up its overwhelming awfulness, from the career-low performances to the bad direction, and especially its terrible script.